Gospel Advocate Company recently learned of the death of Roberta Edwards, a long-time missionary to Haiti sponsored by the Estes Church of Christ in Henderson, Tenn. Roberta was featured on the cover of the January/February 2010 issue of Christian Woman magazine, along with an article describing her work caring for underprivileged children in Port au Prince – her home became the Son Light Children’s Home. The article is reprinted in its entirety below. More information about Roberta and her death can be found at the Estes Church of Christ’s website here. Gospel Advocate Company extends its deepest sympathies to Roberta’s family and friends. When she was a small child, Michemanna’s mother died. She was living with her aunt in Gonaives, Haiti, when a hurricane came through in 2004. She walked through knee-deep, cholera infested water to get to her grandmother’s house to seek refuge. After the storm, food and clean water were scarce, so a family friend brought Michemanna to Roberta Edwards because she believed such a bright girl should have a chance at a better life. Madochee (Mordecai in English) was a little boy of only 4 or 5 when the authorities contacted Roberta for help. His father went to work each day and simply put him outside to care for himself until he returned at nightfall. The father gratefully relinquished his son over to this woman who was known to take children into her home. Lofane was the son of a poor street vendor. His mother gone, he was often left alone to fend for himself with no food and no clothing. Neighbors complained to the police that the father did not provide proper care for his young son, and soon Roberta was called to assist. The man initially refused help, and Lofane continued to believe that poor boys were not entitled to happiness or an education like other children. When he had attended school, the teachers had beat Lofane and made fun of him, calling him a “poor boy” in front of the other students. Roberta was able to gain Lofane’s confidence by reading him Bible stories, finally convincing him that he was loved by God. When he came to live at her house, living and learning became a joy. Missionaries from congregations all over the United States decide every year to schedule trips to foreign countries. The purpose of these trips is for Christians to preach and teach the gospel and also to minister to the needs of those who have so little. Few, however, decide to take up permanent residence in those mission areas. In 1995, Roberta Edwards experienced her first mission trip into the Republic of Haiti, a French- and Creole-speaking country located in the Caribbean. At the time, she did not realize that her trip would lead to the decision to devote her life to helping the Haitian people, especially the children. Why would a young woman want to live in a country that is one of the poorest and least developed countries in the world? Why would someone want to leave the comforts and security of America and go to a place where four out of five people are living in poverty? Why? Because Roberta could not forget the faces of the children who were being neglected like animals in Haiti; she wanted to make a difference in their lives. Roberta has made that difference in the lives of more than 31 children by turning her home in Port au Prince into the Son Light Children’s Home. With a house full of children from age 13 months to 19 years, she has given her life to nurturing, teaching and building Christian character in the lives of her children. Roberta states, “I always wanted this to be their home, not an orphanage.” She is “Momma” to every child. The people of Haiti face high rates of poverty and illiteracy, and many parents either abandon their children or will give them up to others to feed and care for them. Roberta looks at every child as a gift from God. Her home is filled with those who not only have found food and security but also have found the true meaning of being loved and being able to return that love to others. Each of Roberta’s children has come to her with a past life of shame, regret, hurt, abuse or loss. Roberta has restored their self-worth and the support of a loving family atmosphere. Each child has daily chores and responsibilities. Saturday morning is wash day; each has to wash his or her own clothes. In this male-dominated society, boys are also taught to cook and clean. Using the rocky land around her home, Roberta has the boys plow, add manure and sow seeds, trees and flowers. They now raise their own crops and banana trees in the backyard. You can find Rhode Island Reds and other egg-laying hens in the chicken coop. Step into the backyard and look for the fish tank where David Joly (one of the oldest children) is breeding tilapia for sale. An occasional game of basketball can be seen as well. The oldest boy, Thomas, leads the children in their Bible lessons each day, and Roberta teaches homeschool classes five days a week. The children know what a blessing it is both to study God’s Word and to get an education. Thomas looks forward to entering Freed-Hardeman University next year. I met Roberta in October 2009 when I was asked to help conduct a three-day teacher-training seminar for women in Port au Prince. Roberta, along with Ginny Hughes from the Northview Church of Christ in Columbia, Tenn., and Lori Austin from the Washington Ave. Church of Christ in Indianapolis, Ind., invited women from the area churches in Haiti to study together for a weekend. The weekend focused on learning how to teach the Bible in the home and in Bible class. The Northview congregation contributed five of the Betty Luken felt sets to each of the churches closest to the Santo Church of Christ where Roberta worships. The women were overjoyed to have good visual resources to help teach the Word to their children. The ladies at the Washington Ave. church sent more than 400 head scarves for the Haitian women to help keep the hot sun off their heads and as an outreach to the community. Because the Haitian government has only allowed women to seek public education in the past 30 years, women are just now enjoying the freedom to learn. Haiti’s education system is rated among the most neglected in the world. In her article “Haiti: Ex-hausted School System Gets a Second Chance,” Amy Bracken stated, “Less than 15 percent of Haitian children ages 6 to 11 are enrolled in public school. Most Haitian children do not make it to the sixth grade.” The World Bank estimates the country’s illiteracy rate to be 52 percent. Education places a heavy financial burden on families, especially in rural areas. Families that barely earn one dollar a day can hardly afford to feed themselves. Extra money for uniforms and supplies is simply not available. According to the CIA World Factbook at cia.gov, only 52.9 percent of the population can read. To add to the cycle of illiteracy, many of the teachers in the school system are not educated themselves, most having completed education only through the sixth grade. Adding further to Haiti’s problems, the country has been in the path of destruction for hurricanes Jeanne, Gustav, Hanna, Ike and tropical storm Fay. Three thousand people were killed in 2004. When another 800 were lost in 2008, the Estes Church of Christ gathered donations and shipped two 20-foot tankers of food and supplies to Haiti to be distributed to the distressed areas. To help combat illiteracy and provide a Christian education, the church at Santo has started a primary school and now has 78 students, ages 3 to 12. The ministers of the congregation are the administrators, and the teachers earn less than $100 a month. In 1997, Roberta saw a need to organize the Son Light Children’s Nutrition Center, originally overseen by the Amory Church of Christ in Amory, Miss. The work was taken over by the Estes church in November 2001. Children who were able to attend school were going all day on very little food and ultimately could not study on an empty stomach. Once again, through the oversight of the elders of the Estes Church, Roberta planned both a breakfast and lunch for schoolchildren. Now more than 120 children participate in this program that uses neighborhood women to prepare hot meals. Lack of food and good nutrition is an ongoing problem in Haiti. Even Roberta sometimes struggles with the basic necessities for her growing family. She says that the average Haitian survives on only three meals a week. In addition to the Nutrition Center, Roberta organizes ladies classes, mentors interns and facilitates several short-term mission teams each year. The biggest event for the Estes Church of Christ is a spring break medical mission that will usually serve five or six congregations in one week. “Without Roberta’s help, we could not begin to tackle the logistics. With her help, the church throughout the region is served,” says Robertson. Presently, the Estes Church of Christ is preparing to conclude the purchase of an additional home in Haiti. This auxiliary facility will serve as a guesthouse for both long- and short-term workers and as a work site for events such as medical clinics and Bible classes. In the spring of 2009, the church began raising funds and needs an additional $10,000 to reach their goal for this project. Food, clothing, education, shelter – the needs are endless for the work that Roberta must continue in Haiti. Michemanna has grown into a self-assured young woman who served as my translator during the weekend I was teaching in Haiti. She speaks three languages, reads all the time, and is a leader among all the other young girls. She hopes to study at a Christian college in the United States and then return to help her country. Currently, there is one university in the entire republic, and it receives about 25,000 applicants for 200 positions. Lofane, once a boy, has now grown in “wisdom and in stature” and spiritually with his God and his family. He is content to be able to share a home with many brothers and sisters. A head taller than most of them, he is proud of his contributions to the family unit. Children do not develop by happenstance. Without nurturing and love, a child will not develop into a happy and well-balanced individual. 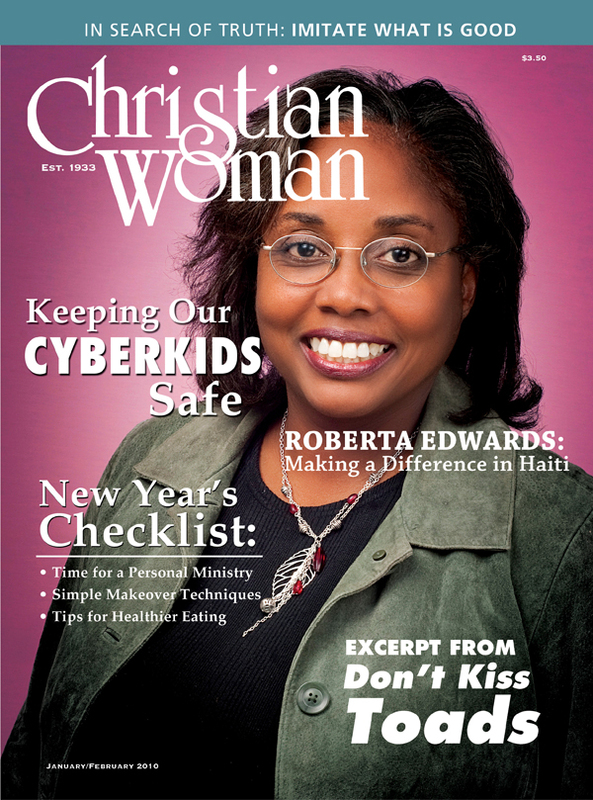 Roberta Edwards has given her life and talents to growing children in the Lord. With His blessings and the help of many others, the work in Haiti will continue not only to save lives but also to spread the kingdom of the Lord. Debbie Bumbalough is the vice president of sales for Gospel Advocate. Her husband, Mike, is the minister for the New Spring Creek Church of Christ in Bon Aqua, Tenn. For more information on how you can help the children of Haiti, contact Robert Taylor at the Estes Church of Christ at (731) 989-7990.